Size : 15.0 x 19.5 inches. / 38.0 x 49.5 cm. Description :Based on Ortelius's map of 1579 which became the basis for many of the seventeenth century maps of the area. 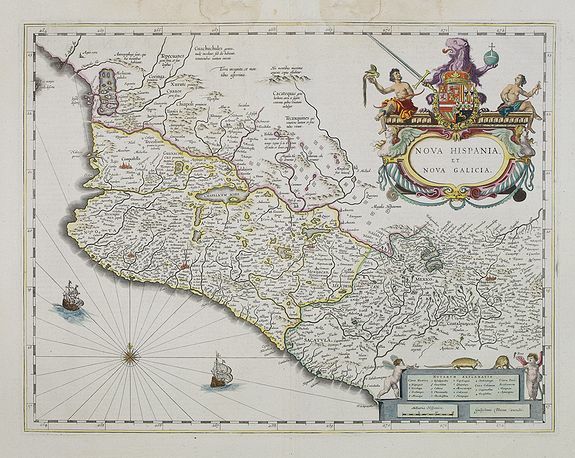 Despite the implications in the title, the map does not cover all of the provinces of New Spain, only a portion of modern Mexico. At the time, the region was described as being rich in gold & silver, with pearl-fishing carried on in the coastal regions. The numerous salt lakes produced the finest salt by means of evaporation, and much was made of the sugar-cane cultivated here. The elaborate title cartouche is surrounded by the Spanish Royal Coat of arms. A lovely copy of this decorative map. Condition : Printed on heavy paper. Some light water staining in upper margin, hardly affecting the engraved area. Dutch text on verso. Wide margins, very good impression.